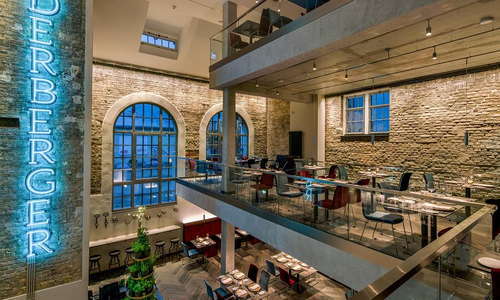 A conversion of a landmarked 19th-century public bathhouse, the palatial stone building opened as a boutique hotel in 2016 but has preserved many of its original details, including the magnificent 65-foot-long indoor pool. Former private bathing cabins have been transformed into full-fledged hotel rooms, keeping historic touches like the original numbered wood doors and subway tiles while adding sleek contemporary artwork. 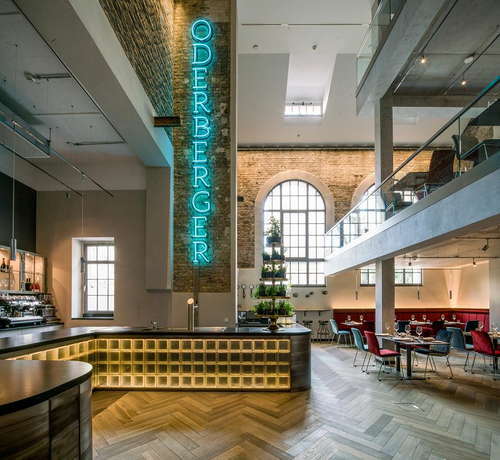 A former boiler room is now home to the industrial-chic Oderberger restaurant, and the fireside Kaminbar is a cozy spot for cocktails. The somewhat sparsely decorated rooms feature oak-plank floors, white-washed brick walls, modern copper lighting fixtures and neutral gray color schemes, with pops of turquoise and deep purple. There are multiple categories, all unique in layout, and include smaller “Comfort” rooms, high-ceilinged duplex “Maisonettes” and sprawling attic “Apartments” with floor-to-ceiling windows, balconies and full kitchens. All rooms come with a fridge, flat-screen TV and free Wi-Fi. YOU SHOULD KNOW There is no air-conditioning in the rooms. Equipped with walk-in rainforest showers and heated towel racks, bathrooms are large and modern, with organic products from Ada Cosmetics Naturals. The apartments have bathtubs and showers. Off the reception area, the comfortable lounge has herringbone floors, black leather Chesterfield sofas, bright orange velvet armchairs and a working stone fireplace. 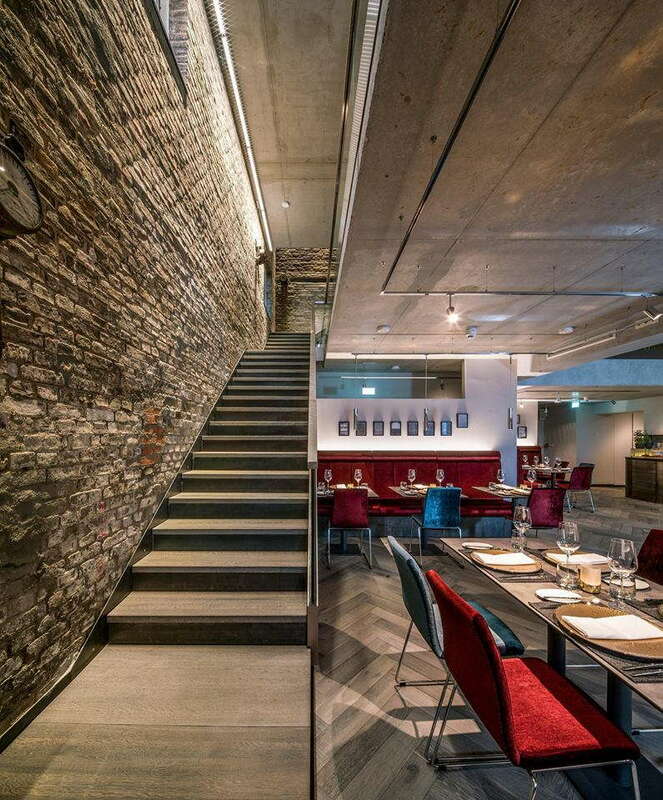 The space transforms into a buzzy bar at 5 pm. Under an architecturally stunning vaulted stone ceiling, the 65-foot-long heated pool is surrounded by arched columns, behind which is the sauna area. YOU SHOULD KNOW As the pool is also open to the public, hotel guests must pay a fee of 4 euro. Note that it is occasionally closed for private events. 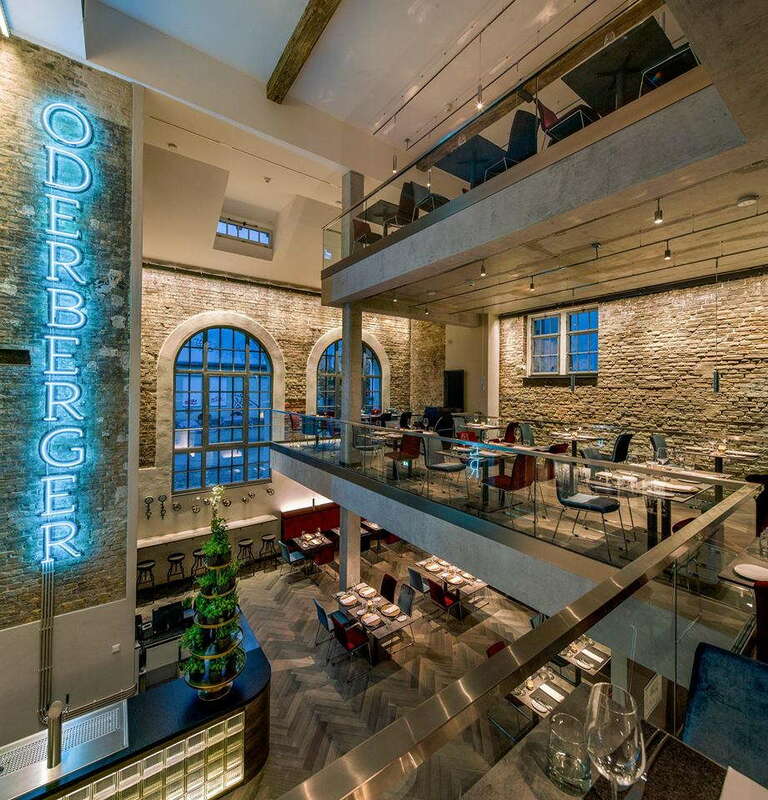 Feast on modern German cuisine in the tri-level Oderberger restaurant; once a boiler room, it features soaring 50-foot ceilings, exposed brick walls, huge arched windows and even the original thermometers. 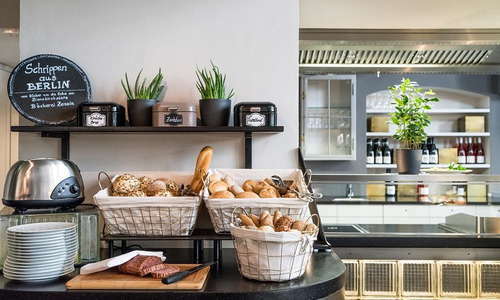 The generous buffet breakfast offers showcases many local products. YOU SHOULD KNOW The restaurant is closed Sunday and Monday. Grab a well-crafted classic or seasonal cocktail at the handful of barstools, or settle into a comfortable sofa or armchair in front of the Kaminbar’s roaring fireplace. 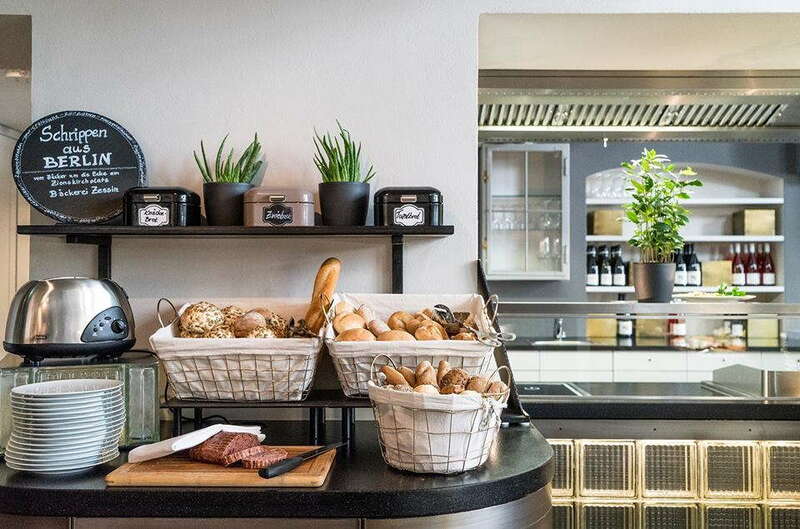 It’s especially popular among Prenzlauer Berg locals for after-dinner drinks and on Thursday nights, when there’s live music starting at 7:30 pm. 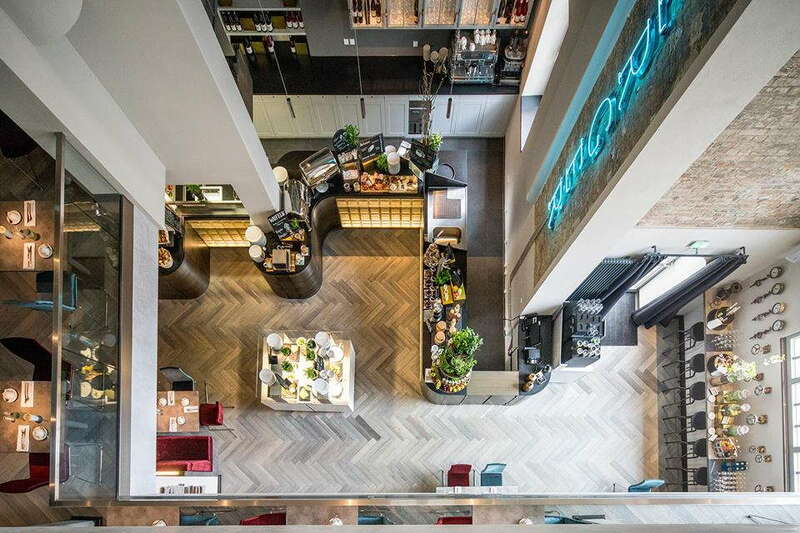 Set on a pretty quiet side street Oderbergerstrasse, the hotel is a six-minute walk to the Eberswalder Straße U-Bahn station and several trams are also nearby. 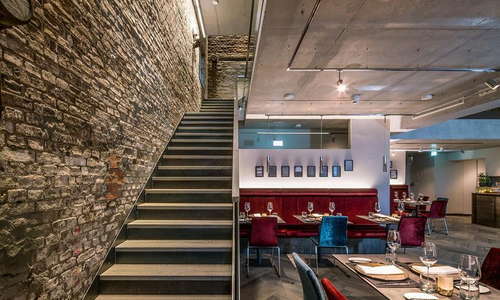 Die Schule (3-minute walk) serves affordable modern German cuisine, including a long list of Alsatian flammkuchen (pizza), in a sleek, airy dining room; the service is exceptionally friendly. American-style smoked meats are a hit at the recently opened Bird Barbecue (1-minute walk). Ring the buzzer to be admitted into the classic speakeasy Bar Beckett’s Kopf (13-minute walk), which mixes outstanding cocktails under the watchful eye of its namesake, playwright Samuel Beckett. Settle in on a vintage sofa and sip a top-notch martini at the locals’ favorite Crossroads (11-minute walk). The restored property seamlessly blends the old and new, with plenty of historic details—including one of the city’s most splendid pools—alongside modern comforts. Personalized touches, like the contemporary photographs by Berlin artists in the hallways and rooms, give the hotel plenty of local flavor. And the hip Prenzlauer Berg location is great for experiencing local nightlife.